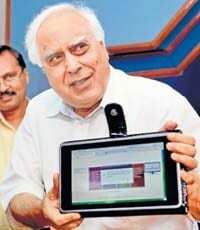 Kapil Sibal, The Union Minister for Human Resource Development (HRD) in India today unveiled the cheap and usable laptop for college students and professors at a meager cost of `1500 (1500 Rupees). This development has gone forward with improvements in certain areas as compared to the `500 version which had to be used with a projector. It is said that it is an upgraded version of the same piece which was announced at the start of last year. It will offer the basic functionalities added to the touch screen function and will act as a computing device but will have less memory space and speed. The above disadvantages of less memory and speed are to be expected from a low-cost laptop which is meant mainly for connectivity and educational purpose. The main purpose of this laptop is to meet the needs of poor students thereby providing them with the basic configurations which will help them in their college projects.The minister has also stated that this laptop won’t be available to everyone but will only be distributed among college students and professors. Moreover, the distribution scheme is still not fixed on what basis the students should get these laptops. At start the cost will be fixed at 1500/laptop. But it is expected to go down to 500-1000/- if there is excess demand from the students thus making it much cheaper. Access to Data with software’s like Open Office and SciLab. It is expected to be available by the start of 2011. Hope to see it releases soon enough so that we can get connected! So how does such a low-cost laptop sound ? Share your views using the comments section. I am co-founder of India’s first cloud eLearning company – BigGyan (BigGyan.com). I am neither surprised nor amazed at this. It sounds too good to be true but as far as tech is concerned, the industry as a whole is already at a place where this is expected. Just see the number of cheap mobile phone companies that have come up recently. As far as hardware is concerned, netbook is nothing but a slightly bigger touch phone. By 2011 (when this product will come to market), industry will be saturated with such products. What I am concerned about is that, why government of India needs to launch such new products and make a mockery of themselves when they fail. Mr. Sibal again has all right intentions just that he ends up going in wrong directions. We have seen so many products by so called IITians where they create fastest car, world’s most fuel efficient car. Somehow, I have never seen any of them to make to the market. It is better that Hon Minister sticks to policy making than engage in Buzz Marketting for his government. I completely agree with you..thanks for sharing your point of view! Mr Deepak you very much correct in comment, and your words are understanble but the problem is with our leaders they are whole hungry of anythng many kind of temptation attract to them and without giving a second thought they came with smiling face on TV screen in stupid way and announced some thing which never be practical or good for poor indians, but suprisingly our leader didnot know that at some extent people of india have became educated to understand the intention of their leaders. Great website! I haven’t bumped on http://www.dailyblogging.org before in my browsing! it will be great if it gets worked.in the midst of corruption i think it would be too difficult for the laptops to reach the student .and also if it gets worked for a long year safley.bad corruption. what do you think guys???????????????? I think this will bring a huge boost to the Technology sector. The youth would love to engage in internet facilities. But will obviously have some downturns. Yep..it should reach the needy. Thats what is important. Thanks Mahesh for sharing your views with us! Lets have tech -revolution ! How great our Indian Brains. Thank God for them. i m belong from bhadrak, odisa, india. but now i m study at bhubaneswar. please send ur shop adress on my mail. I BUY A LAPTOP WHEN and where i find this REPLY ME AT MY EMAIL. ID. will this tablet will be introduced in mumbai colleges? if yes then when and when this sakshat tablet will be launched in mumbai markets? please help me i want to buy this! I am student of class 9th i am very glad to know that a laptop selling at price of Rs 1500.
look its almost last of H1 2011 and no news about this.. our govt just create some committees and forget to work on them or followup on their progress.. this laptop is still a dream for most of the students..
can we purchase this laptop? It was expected to be released in 2011, but I don’t think there is any significant effort from Mr. Sibal on this issue. First of all this Aakash isn’t a laptop, but a tablet pc. And the best way to find out where it is available is to ask your College or main university whether the tablet is for sale right now. I don’t think it is, because it has just been launched so it will take some time to be available fully. Mr. Kapil Sibbal is going to waste a lots of tax payers money in this waste product. This product will not be beneficial for anyone. I have personally seen this product and also a lots of reviewer will be agree. how can i buy akash tablet by net marketting.